It doesn't need to be complicated to get reviews from patients. Reppy makes it easy to ask for reviews, and easy for patients to leave one. Reppy lives on the web and is a "done for you" marketing tool. You just need to share your unique, memorable link with patients when asking them for a review. To ensure they get there, your subscription also includes printable materials to give patients as they leave the clinic. Reppy also integrates seamlessly with these great services, for automated review gathering. When a patient gets the follow-up email after their appointment, and is already on their phone/computer, they'll be asked to share their feedback as an online review. This makes it frictionless for them, and you don't have to lift a finger. We'll even take complete care of the custom integration with your provider. The last thing your staff needs is "one more thing" to think about when wrapping up with patients. Since Reppy makes it effortless for your staff to ask for a review, they can easily mention it when chatting with patients. At minimum, they only need to politely ask the patient and share a handout. Reppy takes care of everything else. Reppy compresses the complicated process of writing a review into absolute simplicity. Patients can be writing a Google review within 4 mindless taps on their phone. integrates with their installed mobile apps. Sweet! Online reviews are essentially just highly-visible patient referrals. And nearly 9 out of 10 people trust them as much as a personal referral. Reviews lead to new patients, which are the lifeblood of your clinic. New patients lead to growth, but also more reviews. And thus continues the beautiful cycle. Reppy allows you to collect reviews easily on all the review sites where potential patients are looking. Whether a patient is on a computer, tablet or phone, they'll have the same quick + convenient experience with Reppy. Since it's not a nuisance for patients, they'll be more inclined to post a review for your clinic. And Reppy integrates with mobile apps patients already have installed (Google, Facebook, etc.) to shortcut the review process even further. A patient with negative feedback is inevitable, but Reppy will guide them away from leaving a poor online review. 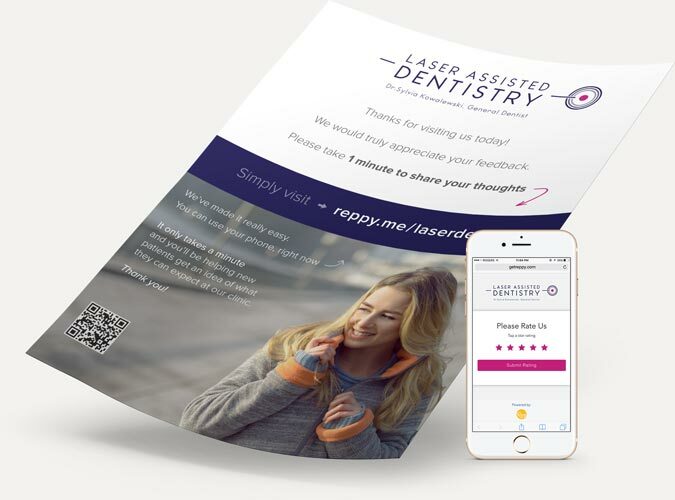 Since dissatisfied patients are more interested in being heard than defaming your clinic, Reppy allows them to privately share their concern and reach a resolution with you away from the public eye. "Reppy has allowed patients to leave honest reviews easily, and share their feedback so new patients will choose us. It's also helped us block negative reviews and get direct feedback." You're amazing! Get the word out. You're going to have an online reputation no matter what you do. Reppy provides the opportunity to be more in control. Get the positive feedback from your patients online, in front of more eyes. Get more new patients in the door.